Clomiphene citrate (Clomid) or Letrozole (Femara) are medications that induce (ovulation induction) or improve (ovulation enhancement) ovulation (expulsion or release of an egg from the ovary). These medications are designed to help the body make more of its own FSH (Follicle Stimulating Hormone), a hormone that signals the ovary to develop a competent and mature egg. These medications are usually taken orally once daily for 5 days early in the menstrual cycle. Side effects may include mild headache, mood swings, vaginal dryness, ovarian cysts, and visual disturbances. Patients who achieve pregnancy with oral medication have a 5-10% risk of having twins. 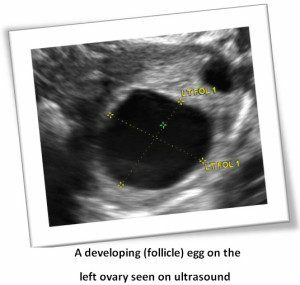 Response to oral medications is often monitored by pelvic ultrasound, and treatment is often combined with closely timed intrauterine insemination to increase the chance of pregnancy. Most pregnancies with oral medications are achieved within the first few ovulatory months. If a patient is ovulatory on one dose, increasing the dose will not make a person more fertile and is not recommended. One or two tablets per day are typically recommended. Very few pregnancies occur with higher doses. What if oral medications don’t work? Some patients fail to respond, fail to ovulate, or fail to achieve pregnancy with oral fertility medications. In these cases, other medications may be added such as insulin sensitizing agents, low dose steroids or injectable fertility medications (injectable FSH/LH called gonadotropins). At this point, most OB/GYNs consider referring the patient to a Reproductive Endocrinologist for evaluation and treatment, if this has not been done already. Reproductive Resource Center of Greater Kansas City, P.A. (RRC) has a fellowship trained Reproductive Endocrinologist, Dr. Celeste Brabec, who specializes in infertility and endocrinology, providing the full spectrum of infertility treatment ranging from the more simple clomiphene therapy, through injectable gonadotropin medications, and on to the more advanced techniques of In Vitro Fertilization/Assisted Reproductive Technology including Blastocyst Transfer and Embryo Cryopreservation.